Tying Note: For deep depths weight the hook and add a large or extra large tungsten cone, black, silver or gold. Glow in the dark Flashabou can also be added into the tail. Tossing flies at marauding Pacific salmon on the open ocean is exhilarating. Coho salmon in particular, are a species with an insatiable appetite. Ruthless predators, Coho consume prey at a feverish pace. Most fly fishers plying west coast waters focus their attention on baitfish, Pacific sand lance and herring in particular. Patterns aimed at imitating these food sources should have a dominant presence within your saltwater fly box. There is another favourite prey worthy of consideration, squid. All five salmon species love ‘calamari’ in their diets as well as bottom fish including the myriad of rockfish species. Both commercial and recreational trollers have used Hootchies, a plastic squid imposter, for years with staggering success. 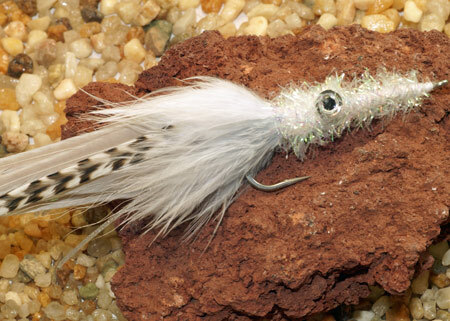 Although proven patterns such as Deceivers and Clouser Minnows are passable squid imitations if you are serious about saltwater you should include your own feather and synthetic Hootchies. There are roughly 300 species of squid worldwide ranging from minute to the Giant Squid of 20,000 Leagues fame. Squid are Cephalopods, they belong to the mollusc class and are distant cousins to octopus. Of interest to salmon, bottom fish and us as fly fishers are the smaller squid species that are less than eight inches long. The Loligo opalescens or Opalescent Squid is of primary importance as they are a shallow water species with a large range along the eastern Pacific coast. A species we can imitate with reliable success. Opalescent Squid have a short less than one year life cycle reaching about 30 cm at maturity. Males are larger than the females. Mating and spawning occurs in shallows offering predatory fish the opportunity to feast on large concentrations of squid. Squid are roughly half mantle (body) half arms and tentacles. The squid’s eight arms are coated with suckers along their entire length. The two tentacles only have suckers at their tips. 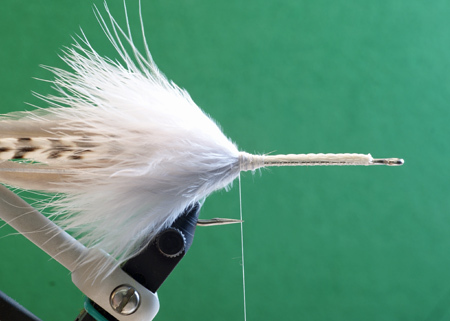 Long shank hooks blended with slender flowing saddle hackles, ostrich herl and marabou are favoured combinations. Sili Legs, SuperFloss Flashabou and Crystal Flash are often blended into the natural feather tails to round out the imitation. 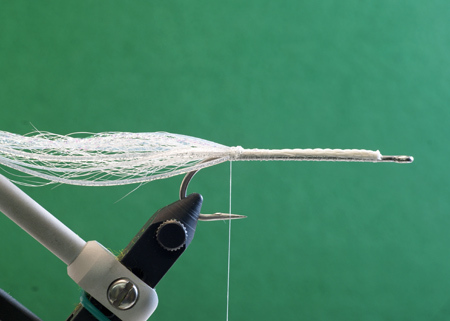 A short sprig of bucktail tied in before the balance of the tail materials adds an element of stiffness reducing tail fouling. Some patterns use contrasting saddle hackles secured along each side of the tail to represent the two tentacles. I prefer the look grizzly (natural or dyed), Cree or variant saddles provide. Some squid are bio luminescent, capable of producing and emitting light to attract a mate or prey. Squid are most active at night and in dull dreary conditions. When using squid patterns in deep water or on dull gloomy days glow in the dark materials are popular. Take a small UV lamp to with you to provide an extra level of light charge to your glow in the dark flies. UV lamps provide superior animation to glow in the dark materials, above and beyond natural daylight. A variety of materials can be used to suggest the elliptical mantle. Dubbing blends, Crystal Chenille, Polar Chenille, braided tubing and Super Weave Mylar tubing are popular body materials. Blending different body materials together can also create interesting translucent effects. Squid possess chromatophores, cells that reflect light and contain pigment. Chromatophores allow squid to change colors depending on factors such as their emotional state. Opalescent Squid for example are naturally a dirty white to blue dun color with brown or gold spots. Excited or frightened Opalescent Squid quickly transform to red or dark brown. It pays to have a variety of squid colors to match the state of the naturals. Many squid species die soon after mating and spawning. Dead squid are pure white and are an easy calorie rich prey item as they drift and tumble amidst the current. Located at the tip of the mantle is a pair of stabilizing fins. Some of the more complex squid designs imitate the fins. Most of the time, imitating the mantle fins is not necessary for success. Squids move through the water using a siphon to ingest and expel water propelling them in the direction they wish to travel. Attacking squid move forward, arms outstretched to snare prey, frightened squid dart backwards legs trailing behind. Our patterns focus on the squid’s frightened posture augmenting the strip pause retrieves used to suggest their stricken path. Besides the color variations the mantle contains a large pair of eyes that are a key trigger. The eyes are located at the base of the mantle near the arms and tentacles. All squid patterns should have a distinct pair of eyes placed in close proximity to the hook point. Predatory fish use the eyes as an aiming point. Locating the eyes within close proximity to the hook point ensures consistent hook ups. Popular eye materials include moulded eyes glued to the sides of the fly or dumbbell eyes complete with iris and pupil. Some dumbbell eyes feature recessed pockets that allow you use a variety of eye colors. Make a habit of coating decal eyes with epoxy or superglue to seal them in place. Dumbbell eyes add weight and provide a seductive swimming motion to the fly. When lashed on top of the shank they invert the fly so it rides point up. This snag resistant profile works to your advantage when probing kelp bed fringes, rocky humps and outcroppings. For probing deep water you can add lead under bodies and cones, either metal or tungsten. To avoid post concussion syndrome chuck and duck heavy weight squid patterns, avoid excessive false casts. Saltwater is a caustic fluid that takes its toll on hooks. Use stout stainless steel or the newer Z-Steel alloy hooks now available in Mustad’s Signature series to combat this corrosiveness. For your squid patterns long shank hooks such as the Mustad S74SZ-34011 in sizes from #2 through #4/0 work best. If west coast saltwater fly fishing is on your ‘bucket list’ reserve a space in your fly box for a few ‘calamari concoctions’ they might save the day if your traditional baitfish designs are off their game. 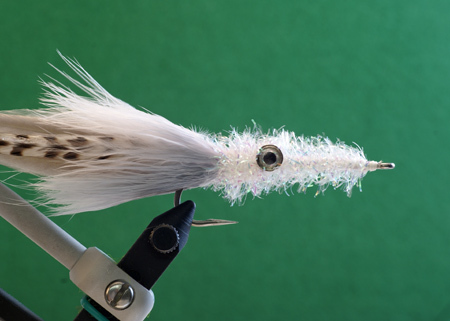 1) Secure in a sparse shank length clump of white or blue dun bucktail followed by 10-12 strands of pearlescent Crystal Flash and 6-8 clear/silver glitter Sily Legs. 2) Tie in four blue dun saddle hackles at the base of the tail on the far side of the hook. Repeat this process and tie in four blue dun saddle hackles on the near side of the hook. The arms should be long, about twice the shank length. 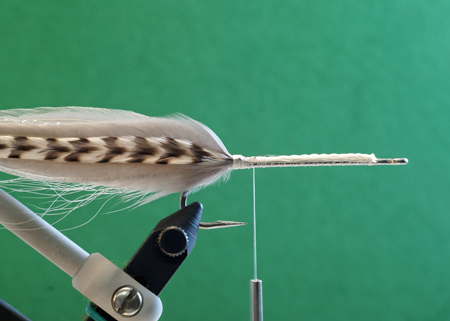 The bucktail, Crystal Flash and Sily Leg tail assembly should be sandwiched between the saddle feathers. 3) Tie in a pair of grizzly saddle hackles for the tentacles. One along the far side of the shank the other along the near side. This step is optional. 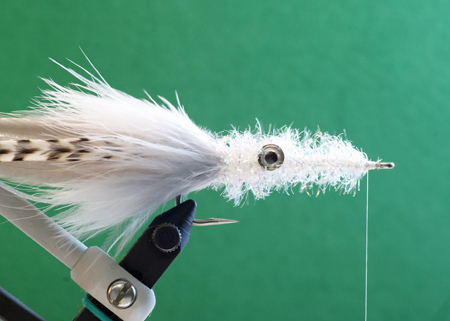 4) Tie a hook shank length of white marabou on top of the hook at the base the arms, tentacles and tail assembly. 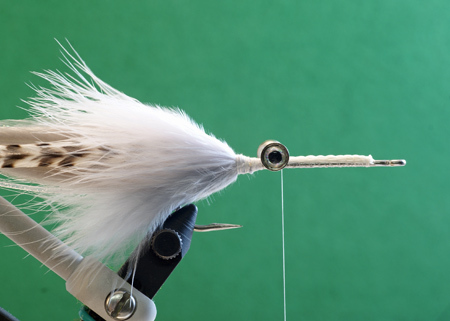 Using a combination of thread and thumb pressure massage the white marabou so it occupies the upper half of the hook. Tie in a shank length clump of Grey Mist or blue dun marabou on the underside of the hook. Use thread and thumb pressure to massage the around the bottom half of the shank. Larger size Mr. Squids may require more than one clump of each color marabou. Move the tying thread forward just in front of the hook point. 5) Take an appropriate sized pair of Fly Eyes and affix silver Prism Eyes into the recessed pockets of the dumbbell. Coat the eyes with a clear adhesive such as Tuffleye, UV Knot Sense or Epoxy to keep them in place. 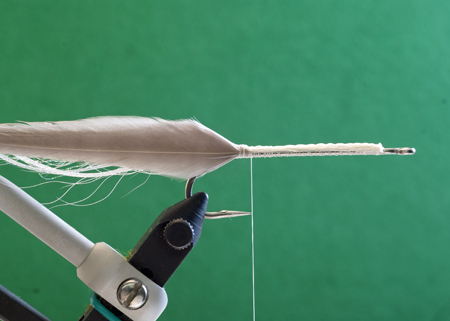 Secure the prepared fly eyes in place using firm figure eight wraps. Place horizontal wraps under the eyes but above the shank to gather and tighten the thread wraps. Apply a drop of super glue for added security. The finished eyes must not roll around the shank. 6) Tie in a length of pearlescent Crystal Chenille directly in front of the collar. Place one complete wrap of Crystal Chenille in front of the collar. Twist the Crystal Chenille tight so the individual fibres stand out from the core. Form the body by winding the twisted Crystal Chenille forward in and around the eyes to the hook eye. Tie off and trim the excess Crystal Chenille. 7) Build a neat head, whip finish and apply cement. Trim the Crystal Chenille as necessary to a tapered shape so the body narrows toward the hook eye.